2. 360°adjustable design of the lamp head to adapt to your treatment needs. 3. The heat lamp increases blood circulation, aids in pain relief of muscular pain. 4. Through infrared light irradiation to the acupuncture points can ease kinds of disease like back acne, cervical spondylosis, lumbar disc herniation, frozen shoulder, soft tissue contusion, sciatica etc. Infrared ray was discovered by British astronomer William Herschel in the study of the thermal effects of the solar spectrum in 1800. This is the first time humans have discovered light that is invisible to the naked eye but its physical properties are very similar to those of visible light ，and it has significant thermal radiation. The NASA research report pointed out that in the infrared the 4-14 micron far infrared rays it can help the human body, which can penetrate 15cm inside the human body, generate heat from the inside, and Promotes microvascular expansion from the body, make the blood circulation smooth. Achieve the purpose of metabolism, thereby increasing the body\'s immunity and cure rate. What is Infrared Ray ? Infrared provides deep heat that can penetrate far below the surface of the skin to produce a soothing reassuring effect upon the muscles and nerves. It relieves muscular tension reduces inflammation and provides pain relief without the need for medication. Laser beauty is to pass a laser beam of a specific wavelength through the epidermis and dermis layer, destroying pigment cells and pigment particles, and the fragments are processed and absorbed by macrophages in the body, safely leaving no scars, and achieving whitening effect efficiently. Far-infrared rays can obviously play the role of anti-inflammatory and analgesic, promoting blood circulation and removing blood stasis by utilizing its good thermal penetration effect. It has high radiation frequency and strong permeability. It is used for local infrared radiation, improves metabolism, eliminates inflammation and accelerates wound healing. It has an obvious curative effect on muscle strain, joint pain, lumbar pain, and cervical pain. How to make The Infrared Ray treatment ? 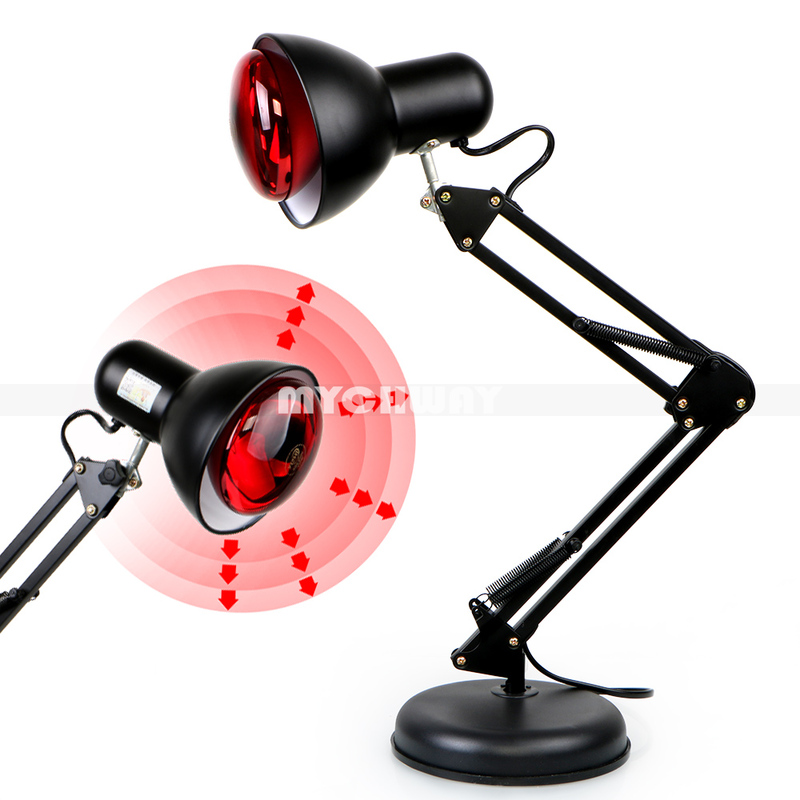 Step 3: Keep a distance of 30 cm between neck skin and lamp, set the temperature until getting the best comfortable heat. Working time: 30 mins for adult,20 mins for children for each treatment area. 1. Ask the patient care before treatment to find out if there are contraindications to the treatment. 2. Before treatment asks patients to remove metal objects within the range of radiation field. 3.if do a treatment on the part which closes to the eyes, They can be worn with colored glasses or covered with wet gauze to protect eyes. 4. During the irradiation of the bulb, the patient\'s local skin reaction should be observed at any time, such as a pink uniform erythema on the skin, which is a suitable dose; if the skin appears purple-red, stop the irradiation immediately and apply Vaseline to protect the skin. The heat lamp increases blood circulation, aids in pain relief of muscular pain. Through infrared light irradiation to the acupuncture points can ease kinds of disease like back acne, cervical spondylosis, lumbar disc herniation, frozen shoulder, soft tissue contusion, sciatica etc. Does infrared ray has any risk ? The effect of infrared radiation on the body is mainly skin and eyes. When infrared rays illuminate the skin, most of it can be absorbed, and only about 1.4% is reflected. Larger intensity for a short time to treatment, local skin temperature will rise, blood vessels will be dilated, erythema reaction occurs, and erythema disappears after stopping the irradiation. Repeated irradiation can cause localized pigmentation. Long-term exposure to low-energy infrared rays can cause chronic damage to the eye, usually chronic congestive blepharitis.